Let's remember where they already met. Classic style in interior design is a celebration of refinement and taste. All elements of the design of the classic bedroom are made of natural materials, mainly from expensive wood. Due to this, the shades of this interior are predominantly dark brown. But other, lighter versions are possible. 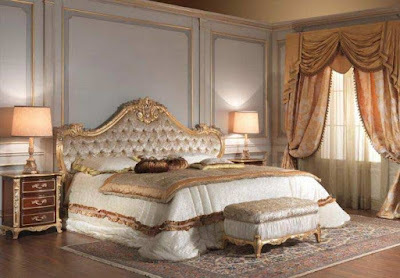 Textile products for the bedroom in the style of the classic are made of thick fabrics. The classical style is dominated by the severity of forms and the clarity of lines. 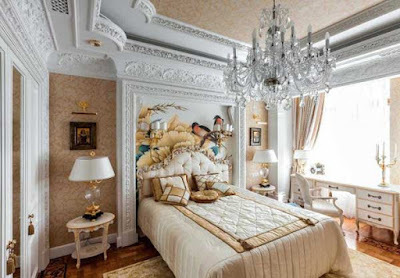 An ideal example of a bedroom design 2019 in a classic style is Mr. Gatsby's bedroom from the movie of the same name. Just look at this stunning interior! 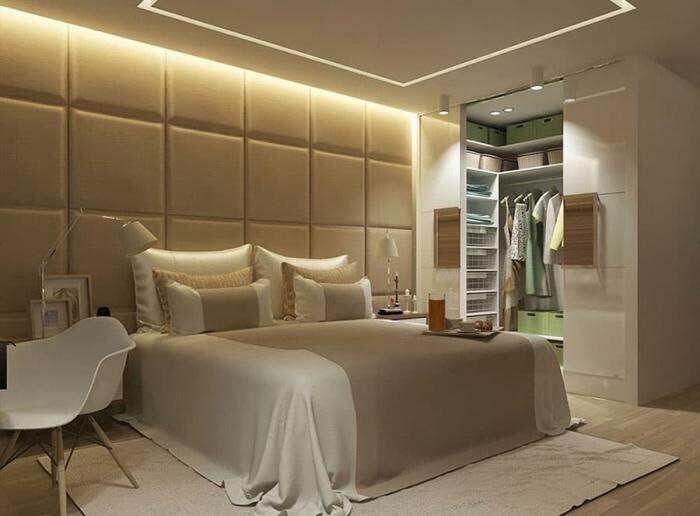 A spacious bed in the center of the room, a wardrobe with open shelves, a minimum of details (and not a single extra!). By the way, open racks and shelves are one of the main trends of 2019. 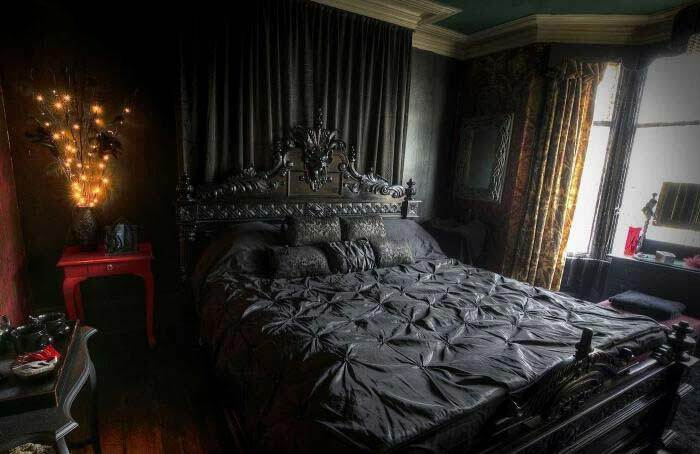 On the floor of the bedroom of the protagonist there is a carpet with an unusual, but a not catchy pattern. 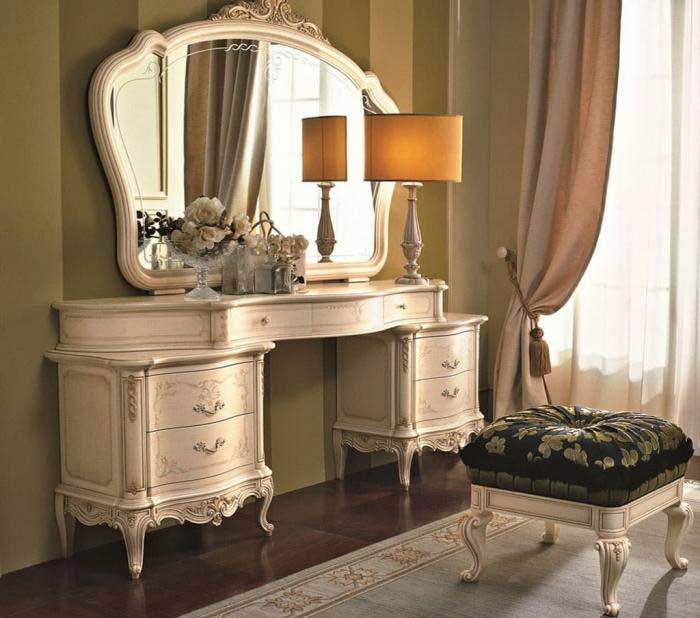 In the corner near the window, there is a miniature dressing table. Ladies, you see, for such a one will feel like a queen! 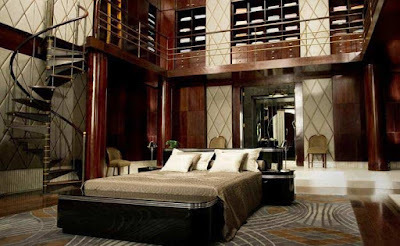 Very interesting in the interior of the Great Gatsby look wall panels with a soft light upholstery that dilutes some gloom of mahogany, and a mirror on the far wall visually expands the space and doubles the light emanating from the windows. 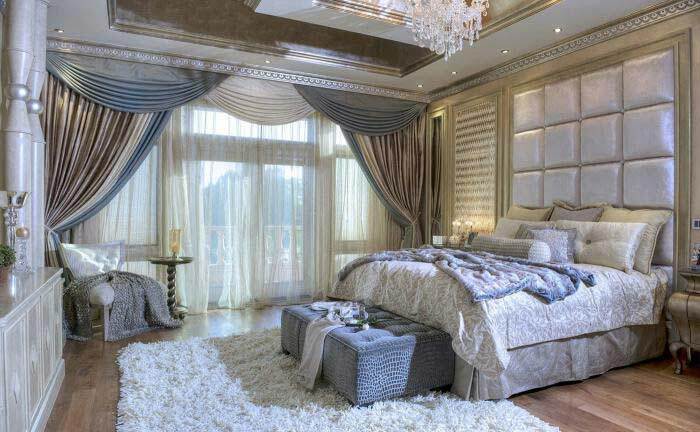 Of course, this two-story bedroom designs 2019 in the classical style is a real dream! But in our realities classicism will be an excellent choice. Especially since the classic is so and classic, to be out of time and change of epochs. Look at the amazing ideas that designers are proposing to implement in 2019. Because of the traditional use of the baroque style is often confused with the classical style. Still would! Both of these are natural materials used. And there you will not find neon, rich, expressive shades. Both classic and baroque are used in interior design already for a long time (mainly in rich mansions nobles and palaces of royal persons). In translation from the Italian "Baroque" means "a tendency to excess." Unlike the strict and restrained lines of the classics, the baroque interior is an interior with a huge number of carved elements, moldings, angels, flowers and other relief decorations. The bedroom in baroque style is filled with florid legs, unusual handles, and hooks, complex decorations on the backs of the bed and cupboard doors, fabrics with embroidery gold thread and heavy candelabra. By and large, there is no functionality in this, but it looks delicious. Otherwise how to explain that this style is so popular with filmmakers? We could not even single out a single film with the best new bedroom 2019 in the Baroque style! 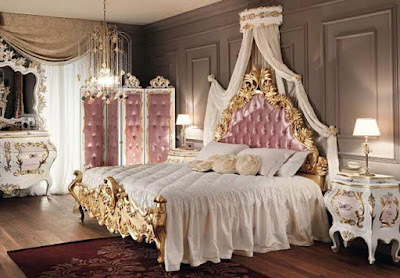 So look at the selection of the most interesting baroque bedrooms from different films in our opinion. And pay attention to the details. They are beautiful! Remember! 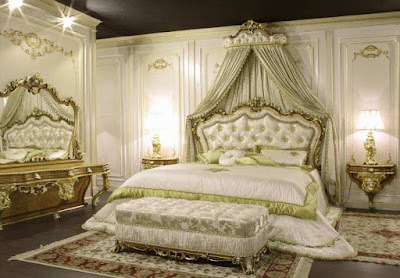 If you design a bedroom in the Baroque style, select all the decor so that it does not interfere with you. Otherwise, bruises and ragged clothes cannot be avoided. Thanks to a combination of difTired of the "classic of the genre"? Then forward to new ideas! The high-tech style is only the most fashionable, the coolest, the most technologically advanced ideas and solutions. This is an abundance of metal and light, smooth surfaces, and functional details. Does not sound very cozy for the bedroom? So you just have not seen the movie "Passengers"! That's where the style of hi-tech is presented in all its glory! Of course, sometimes each of us wants to hide in an individual capsule like the main character and sleep there for dozens of years in peace and quiet. But fortunately for us and our loved ones, this is not possible, and therefore we will borrow another, equally worthy idea from this film. 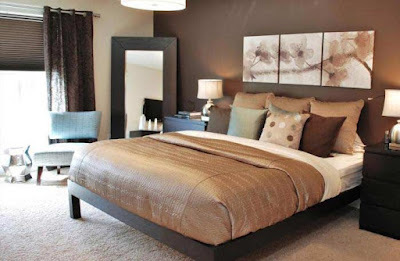 Due to the fact that the bedroom is made in beige tones, it is not perceived as cold and unfriendly. different options for local lighting, the protagonist's bedroom ideas 2019 each time looks different. 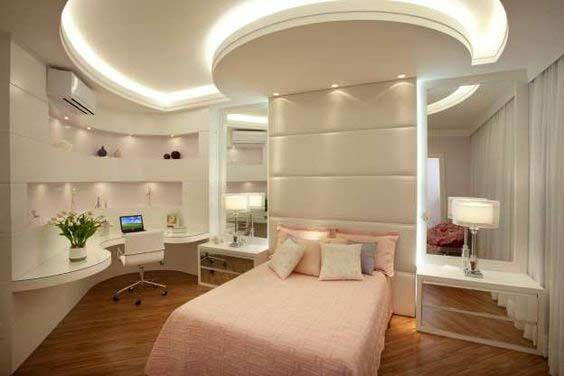 Functional details like a rotatable bedside lamp will be an excellent solution for a small room in a Khrushchev. Very cool look bedside tables, which in fact are a continuation of the bed frame. But instead of bedside tables used niches in the wall on each side of the bed. 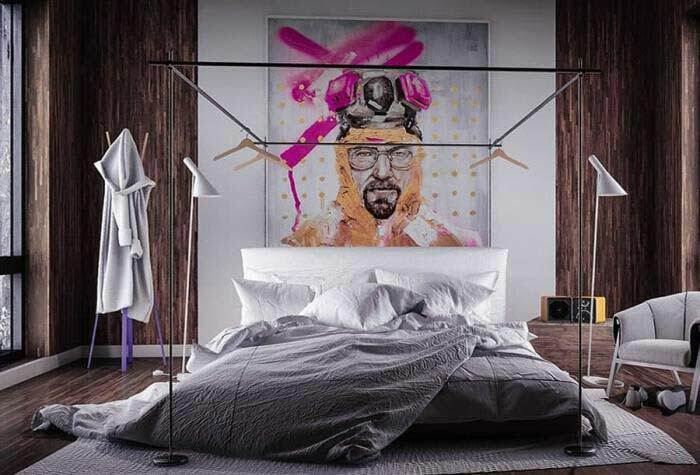 It would seem impossible to combine the bedroom styles of high-tech and nature. 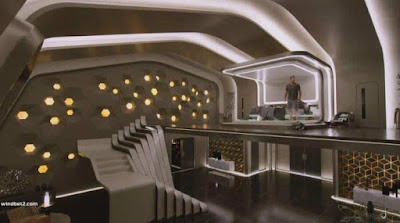 An-no, and here the designers of "Passengers" surprised us: a huge plasma in the whole wall with stunning scenery (which in the future may be called video footage) harmoniously blends into the overall picture. At us, such an effect can be achieved with the help of photo wallpapers. 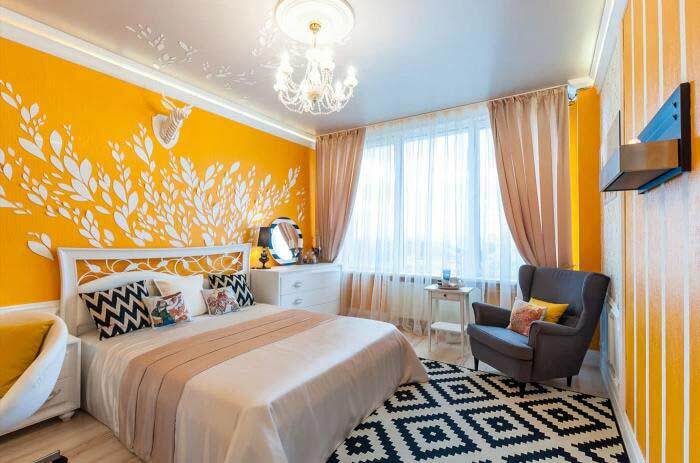 Especially for you, we have prepared some more fantastic solutions for 2019 for high-tech new bedroom 2019. Be inspired ... And act! Restraint of modern style is beautifully reflected in the house of Amanda from the movie "Holiday by an exchange." The creators of the film did not accidentally turn to him because the interior largely reflects the character of the main character: decisive, courageous, solid, self-sufficient. A moderate gray scale of colors perfectly harmonizes with soft fabric materials. 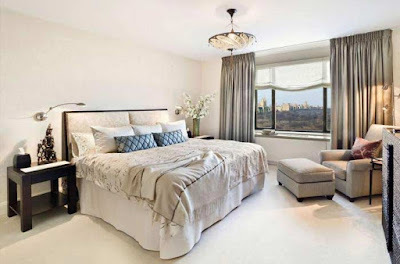 Despite the severity of the lines of modern bedroom styles, the feeling of the coziness of the bedroom is attached to a huge white and fluffy carpet. Please note how the windows of the bedroom in a modern style are combined with Roman curtains and heavy curtains on the floor. 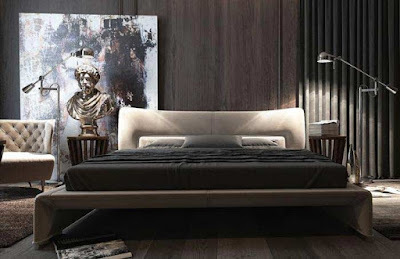 An interesting design technique: the main gray color is highlighted by darker elements (Roman curtains on the windows, pillows on the bed). But the second heroine of the movie "Holiday on the exchange" Iris completely different bedroom ideas 2019! Bright textile elements, the asymmetry of the furniture arrangement, a warm range of shades - all this is typical of the country style. The rural theme of the interior is emphasized by wooden ceiling beams and wicker baskets with firewood. The fireplace in such a bedroom designs 2019 is not perceived as a luxury item but as a really necessary element of comfort and coziness. Raznoboynaya furniture from different suites is organically combined with each other, which gives the room a rustic charm. House Iris is a purely English offshoot of country bedroom styles. But do not limit yourself exclusively to them! Trend 2019 - the use of roughly textured materials (wood, stone).And it is this trend that fits perfectly into the village theme! And this is how in 2019 the country new bedroom 2019 of southern France look, better known as the Provencal bedroom styles. "The East is a delicate matter," said Comrade Sukhov in the well-known film "The White Sun of the Desert". And he was right! From ourselves we add that the oriental style is not just subtle, it is light, delicate as if woven from millions of weightless threads. 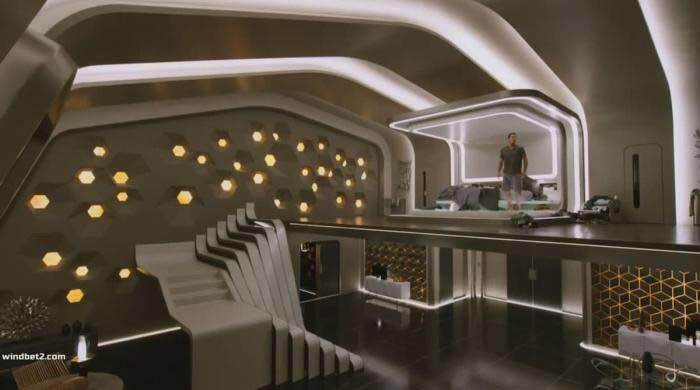 And you can be convinced of this by the example of interiors of the pearl of Turkish cinema - the series "Magnificent Century". The fairly heavy dark palette of the eastern bedroom designs 2019 is balanced by elegant ornaments. And these ornaments are everywhere! Beds of the new bedroom 2019 in the oriental style are decorated with translucent canopies, as well as carved posts on which they hold. 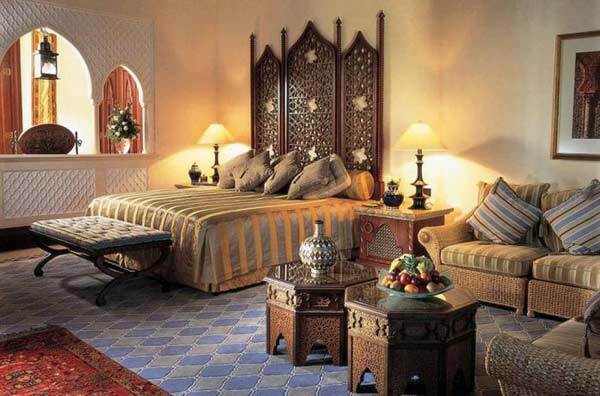 For finishing the floor, ceramic tiles with Arabic ornate ornaments or carpets are used (which is preferable for a bedroom). In addition to the main bed in the new bedrooms in 2019, there are necessarily additional couches or sofas. For the cladding of walls, fabrics are used, but in an apartment, it is more appropriate to replace them with wallpaper with a suitable print. 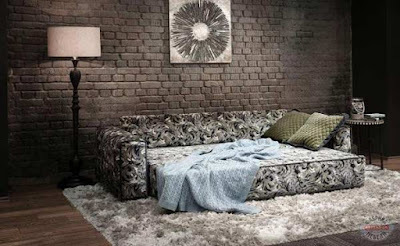 The peculiarity of the Turkish style is the use of a huge number of pillows in the interior bedroom designs in 2019. 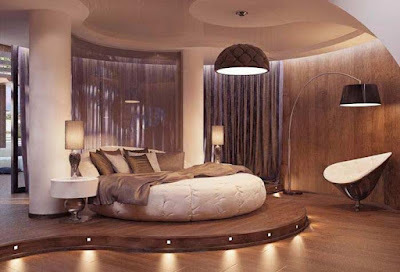 Modern designers offer these types of bedroom designs 2019 in oriental style. 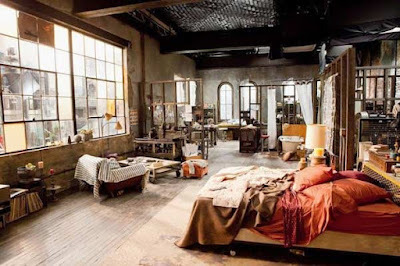 Which bedroom styles fits more into the studio space of the main characters of the movie "Love and other medicines" than the loft? Perhaps this is the case when the room itself initially sets the tone for the entire interior. Thanks to the huge windows, local luminaires are practically not used. All the functional zones of the apartment smoothly flow into each other, the sleeping place is the heart of the whole space. All the details of the interior and accessories came here as if by chance, not at the same time, but it is through this that a truly often charm is created. It is almost impossible to single out the dominant color in Maggie's bedroom. At the same time, the interior harmoniously combines warm and cold shades of brown. 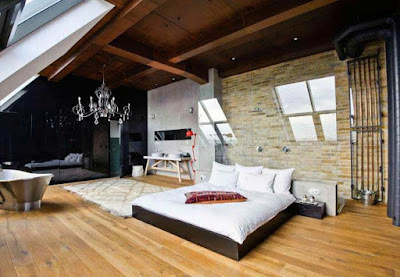 bedroom styles loft is considered one of the most flexible styles in the interior, which you can easily adjust for yourself. Still, do not know which style is right for your bedroom decoration? Then decide on the color! Maybe this will help you to choose your style later on. As you have already guessed, many styles are characterized by their own color scheme. For classics, it is dark woody shades. But in the realities of the post-Soviet space, when choosing a color, it is necessary to start from the very room first of all, and not from the style. Light colors for the bedroom designs 2019 are very much in demand due to their ability to visually expand the space. In addition, the chance to wake up in a good mood is much higher in a bright and cozy bedroom than in a dark crypt. White color in the interior is a guaranteed feeling of lightness and purity. 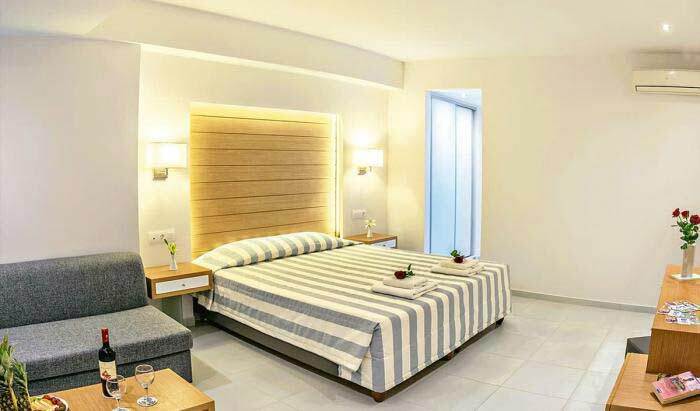 The white bedroom literally breathes freshness. But to make the white color look as attractive as possible, very good natural light is needed. The fluorescent lamps give the interior of the bedroom in the white color of hospital uncomfortable. The trend of 2019 was the dilution of the snow-white interior with bright accents. 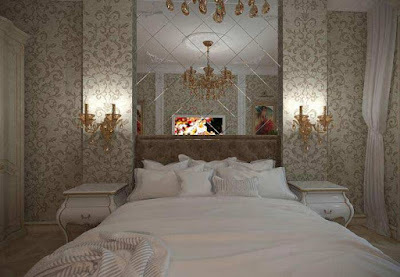 Are not an exception and the interiors of the new bedroom in 2019. 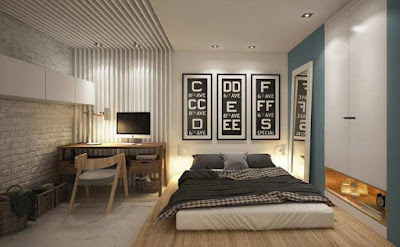 It can be dark floors, bright pillows or ornaments on the accent wall above the head of the bed. Cold pastel colors - ideal for small rooms with an overabundance of light. Most often these are rooms located on the south-eastern side of the house. 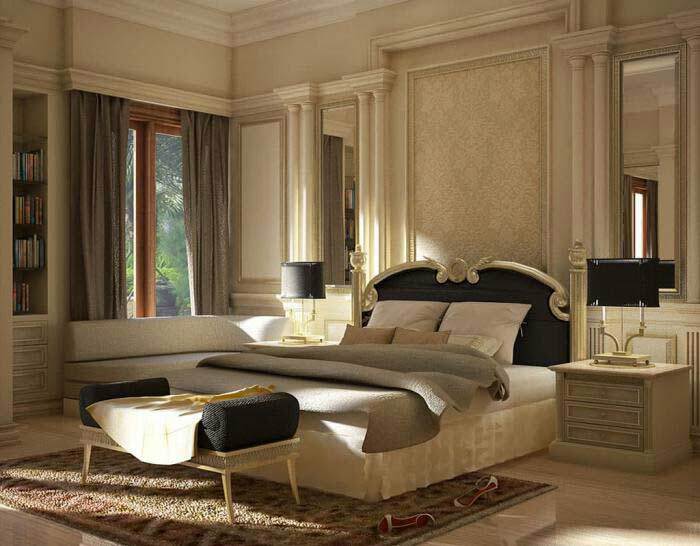 The most characteristic is a palette for bedroom styles in Provencal and modern styles. Do you need a space in which you would feel completely protected? Or, perhaps, your rhythm of life requires you to get enough sleep only during the daytime, when daylight comes from everywhere? Or maybe you are tired of typical solutions and you want something extraordinary and impertinent? 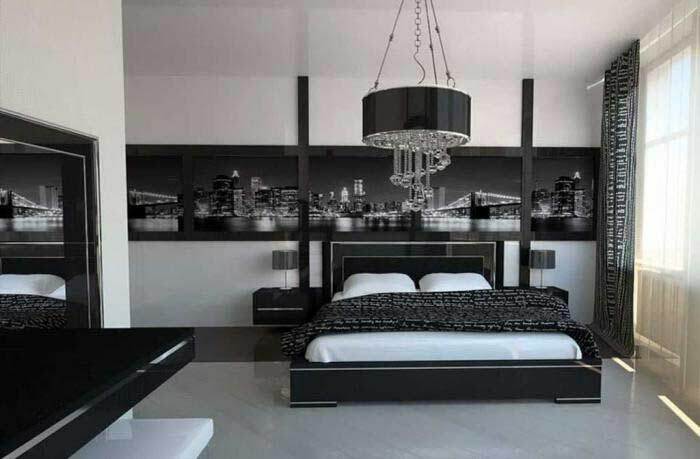 Then the bedroom ideas 2019 in dark colors is exactly what you are looking for! The main thing to remember when decorating a new bedroom 2019 in dark colors is the need for high-quality artificial lighting. To dilute the moroseness of the dark bedroom ideas 2019 will help bright contrasting accents. The new bedroom 2019 is a very individual space. She does not have to brag about the guests because there is a living room for this. But it is very important that you feel comfortable in the bedroom, you can relax and gain strength. So if in the office you are a tenacious business lady, and in your heart a crazy girl - it does not matter! 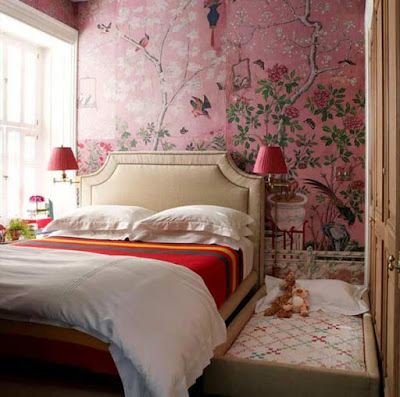 Make your bedroom bright, unusual, interesting! You can evenly distribute bright details throughout the room, or you can color in one place. In the second case, it is best to combine a bright color with more neutral shades. Are you a romantic dreamer? 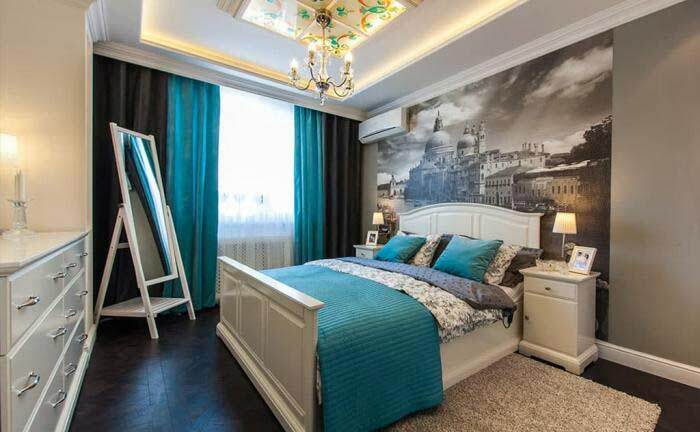 Make your bedroom designs 2019 in turquoise colors. Strive to be a man of action? Use red or orange color. A vulnerable Turgenev young lady? You will surely like the room in lilac tones. Do you want to feel the maximum unity with nature? 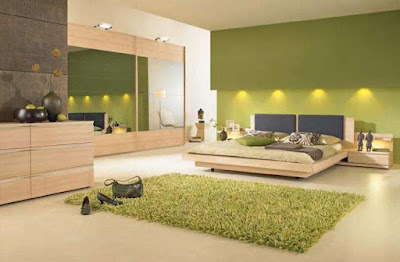 Then the bedroom in green colors is exactly what you need. Wake up beautifully! 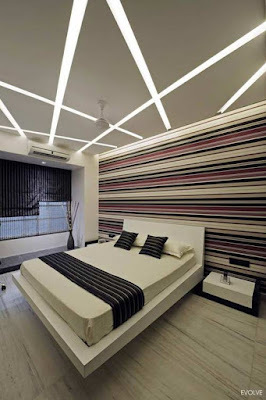 How to decorate the bedroom ceiling in 2019? The ceiling is that part of the room that we see as the last one to fall asleep and the first to wake up. In order not to "spit in the ceiling" at night, you can hang up the TV. Especially modern ultra-thin plasma for this is fully adapted. And wake up to your favorite TV shows or videos will be much nicer. From the style of decoration of the room (stucco for baroque, country beams, stretch ceilings for high-tech style). 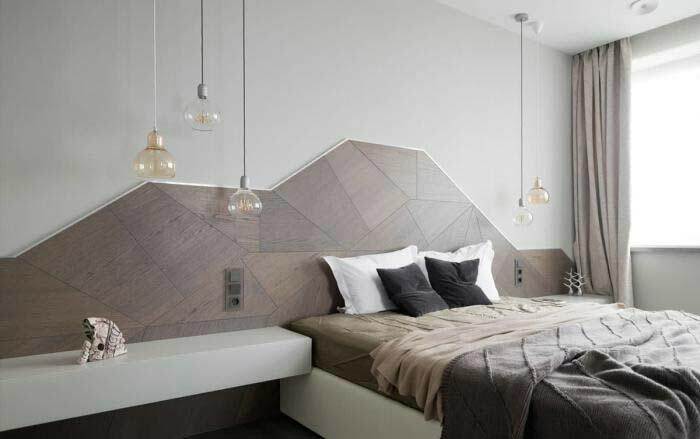 What you need to know about the design of the bedroom walls in 2019? 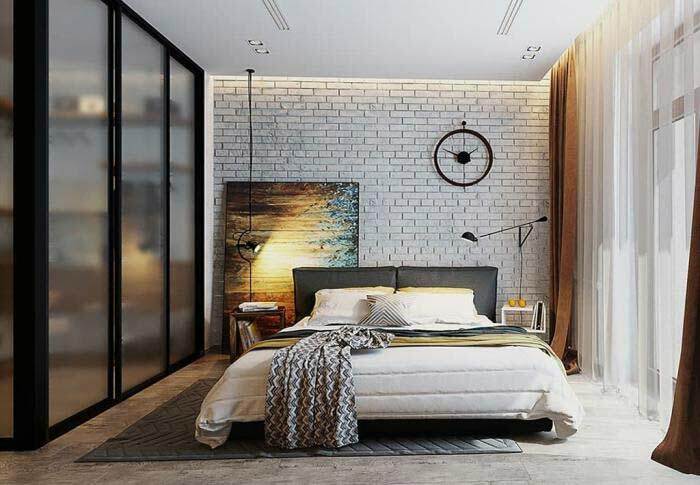 Beautiful bedroom ideas 2019 are first of all beautiful walls. 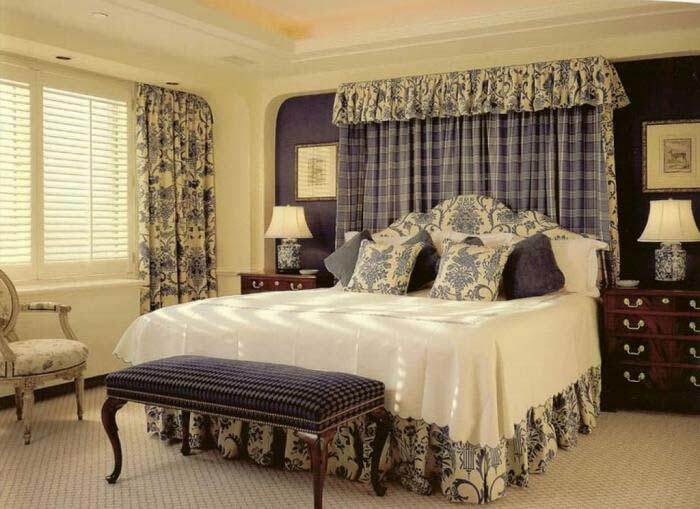 (For more information on selecting wallpaper for the bedroom ideas 2019, see the next page). 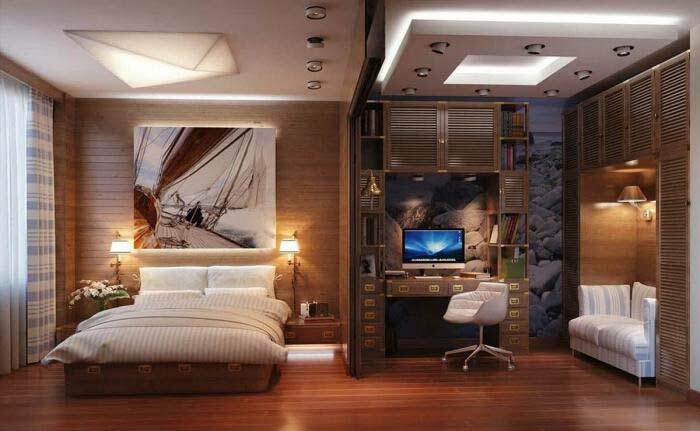 Above the bed is not recommended to hang any shelves or lockers. According to the teachings of Feng Shui, such a decision will energetically put pressure on your consciousness and interfere with full-fledged relaxation and restoration of strength. According to the logic - once a year and a stick shoot, and the shelves can crumble directly to your head. That's why a free wall above the bed often becomes accentuated and is highlighted in color, print or accessories (remember the pictures above Amanda's bed from the "Exchange Holidays"). The most budgetary option for highlighting the accent wall is the use of combined wallpaper or wallpaper of two colors. To all the beauty of your bedroom could be appreciated at any time of the day, of course, you need light. How to organize it? 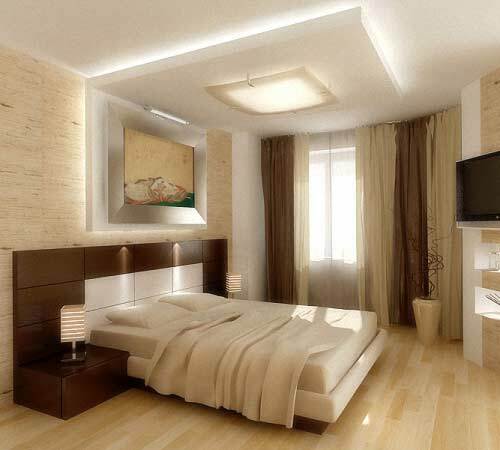 First, the bedroom styles need a general ("top") lighting, which will make the entire room visible at any time of the day. This is convenient both during harvesting, and during the search for a thing, and just in the evening time. 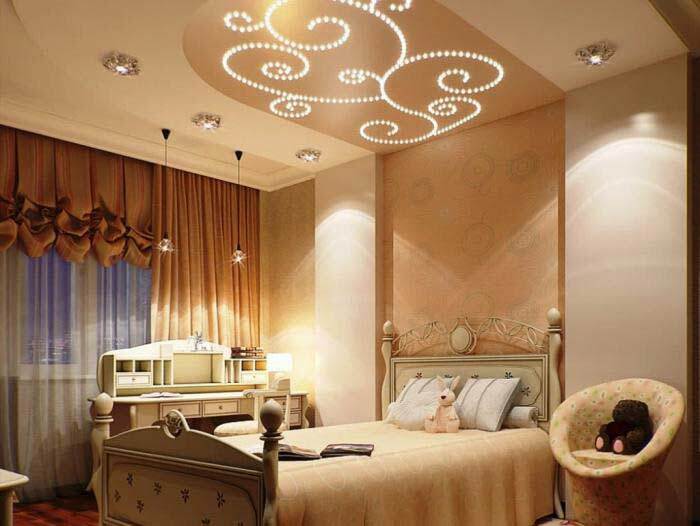 Common light can come from a single point (chandelier) or be dispersed around the perimeter of the room (a frequently occurring option when decorating a ceiling with plasterboard). Secondly, near the bed is necessary bedside lamps: wall sconces or floor lamps. The main thing that you could reach them without getting out of bed - and read before bedtime is more convenient, and turn off the light at night. Thirdly, if in your bedroom there are any additional zones (cloakroom, workplace, baby cot), they also need local lighting. Well, since we have started talking about electricity, it is necessary to install a socket near your bed. Believe me, this is a very necessary thing! The same is necessary as the curtains on the windows. Lambrequins can be simple and multi-level, from light air fabrics, shading tulle, or from dense materials. In such styles as modern, Mediterranean, modern, minimalism, curtains without lambrequins are most often used. The length of the curtains depends on whether they cover only the window or a window with a balcony door. In the first case, it is permissible to use short curtains, and in the second one, without curtains, you can not get on the floor. Also, it matters whether something is located under the window. For example, if your desk is close to the window, then pulling the long curtains will be at least uncomfortable. 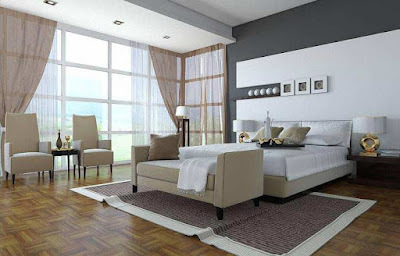 Before buying furniture in the new bedroom 2019, you should always think about what will be in it and where to stand. Only carefully adjusted layout will make your bedroom designs 2019 not only comfortable but also beautiful. What of furniture is necessary for the bedrooms 2019? It can be a bed, and maybe a sofa (if the bedroom is small ). The sleeper should be of a suitable size: an average of 50 centimeters on the edges from lying in width and 20-30 centimeters more than its growth in length. 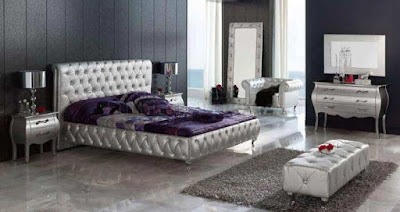 Beds can be with a headboard, with a foot (a rim at the feet) or without them. In addition, they can be on legs or on a solid frame. Which one to choose depends on the shape of the room and its layout. For example, a sofa-euro book is good for a narrow stretched room, while a draw out sofa is an excellent option for square-shaped rooms. 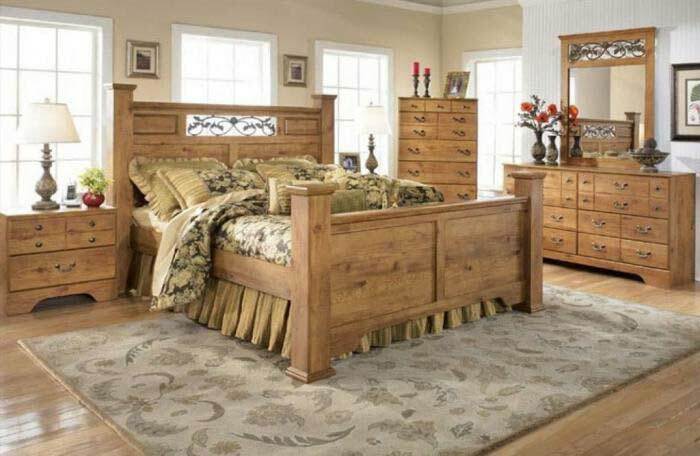 When choosing a bed, pay special attention to its rigidity. If your sofa or mattress on the bed is too hard or too soft, it will affect not only the quality of sleep but also the health in general. Otherwise, when choosing a bed, you should rely on your aesthetic preferences, needs, and intuition. If the area of the bedroom allows - put in it a small dressing table with high-quality spotlighting. With it, you will always look like a queen! 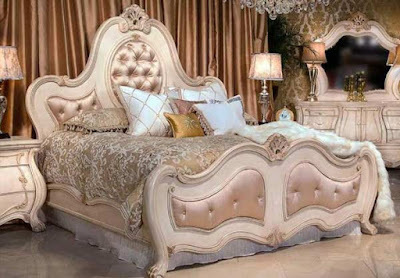 A separate line I want to say about the bedroom designs 2019 of the head of the bed. On the one hand, it's kind of like a part of the bed, but on the other - to call the headboard smoothly flowing into the ceiling the furniture does not turn the tongue. 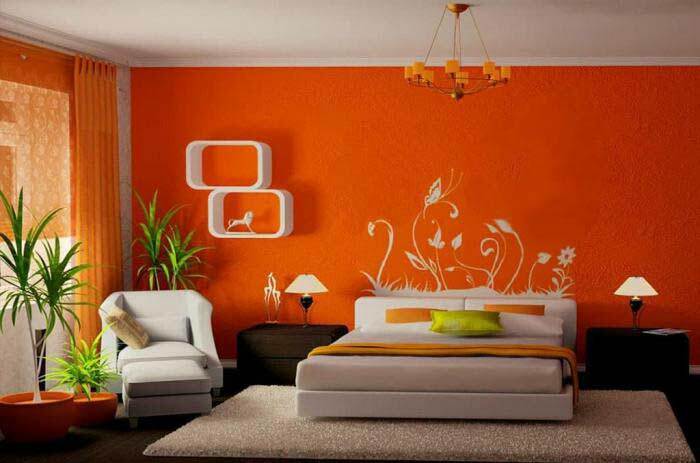 In addition, the wall above the bed often becomes accentuated and its decoration should be approached particularly carefully. 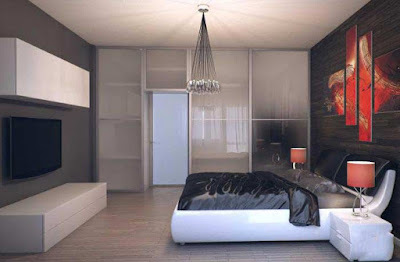 Let's deal with the coolest design ideas for the bedroom styles of the head of the bed and the accent wall. 1. 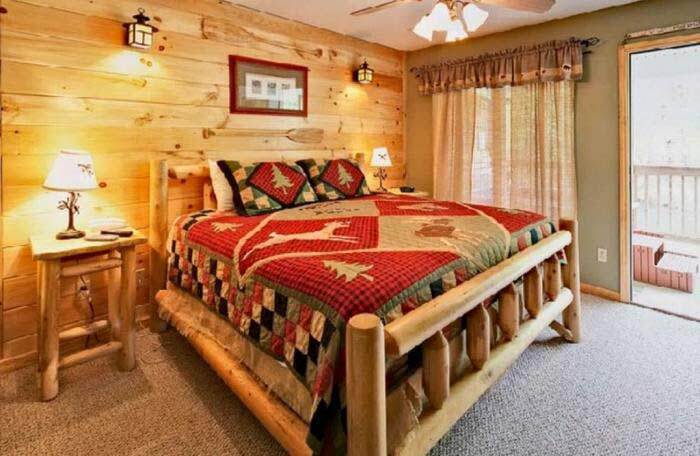 Wooden headboard. Perhaps the most traditional option. It is not expensive and quite cozy. In addition, the tree is very pliable for experimentation material: it can be burned, painted, cut. 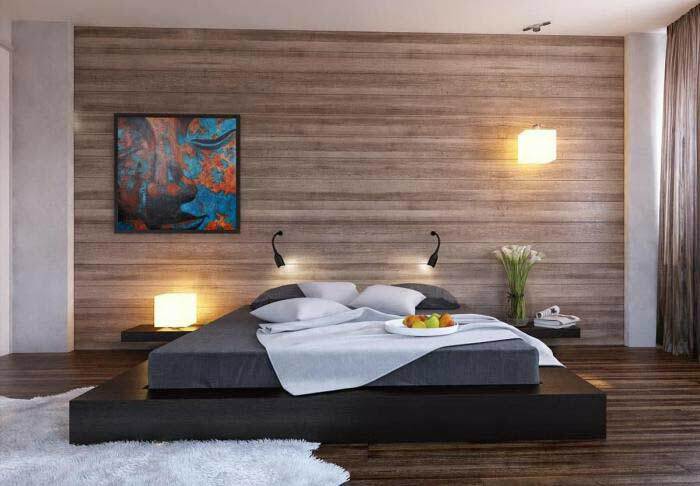 In our opinion, a very interesting option for the design of the head of the bed - the use of decorative wood panels. 2. Head of cloth. That's really what really appreciate lovers shoving their hands deep under the pillow or throw them upstairs! Soft, comfortable, pleasant to the touch. Not ahead, but a fairy tale! 3. Hinged shelves. 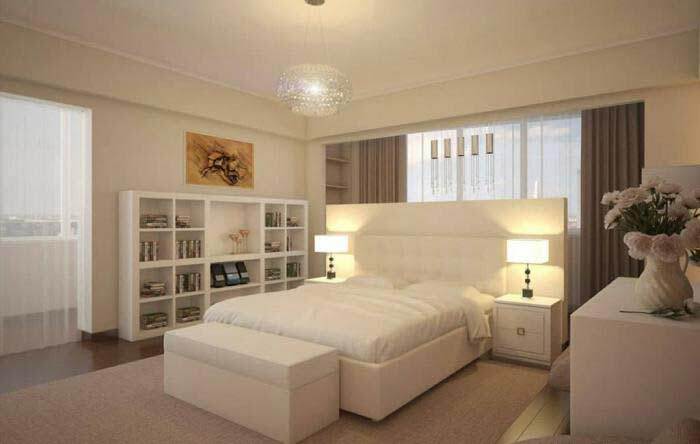 Perfectly suitable for an interior in which there was no room for bedside tables. And stylish, and comfortable. 4. For those who are afraid of panic that something will collapse on their head, designers suggest using a niche at the head of the bed. The functionality is the same as that of the shelves, but the risk of being literally under the rubble is much lower. 5. Arched niches. In contrast to the niche-shelves - it is the recesses of the wall into which the bed is inserted. Their design may differ from the rest of the walls. It can be a brickwork, a drawing, a fashionable wallpaper with a large print or a decorative panel made of marble. The main advantage of arched niches is the possibility to place additional spotlights on them. 6. Baldachin. A great option for romantic princesses! 7. Headboard-ceiling. And no matter what it is made of: wood, decorative putty, wallpaper or metal. 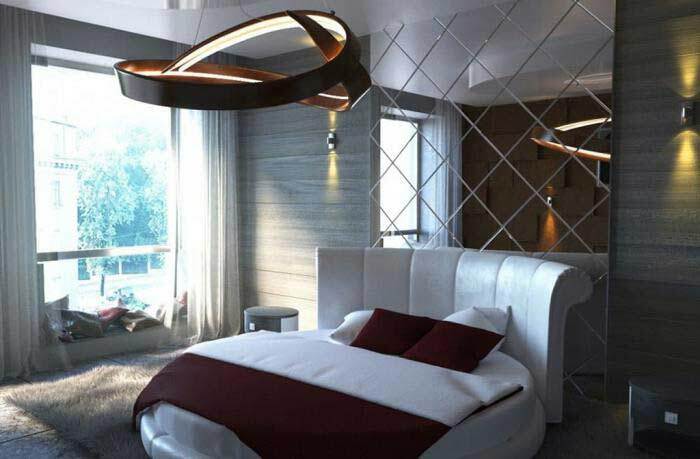 The main feature of such a headboard is that it flows smoothly from the bed to the ceiling. Thus, the sleeping place visually completely separates from the rest of the room space, which is very good, for example, for the bedroom. 8. The mirror head of the bed visually expands the space and makes the room lighter. Doubt that the area of your bedroom is suitable for the realization of all your ideas? Let's discuss this! 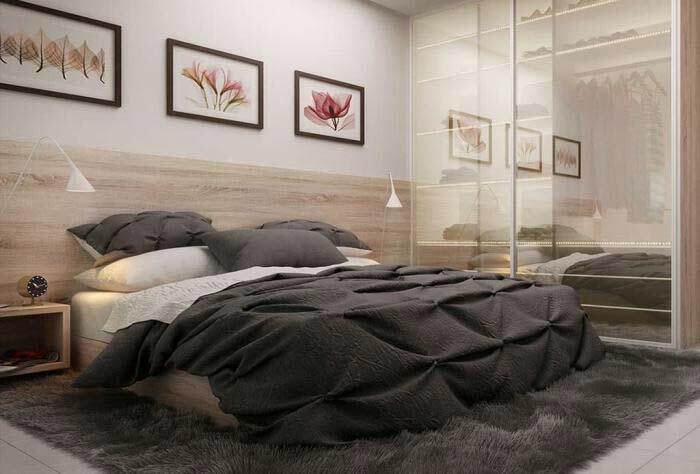 See how easy it is to create a cozy interior in a small bedroom! Agree, very few of us can boast a truly luxurious and spacious bedroom. But the comfort of the new bedroom 2019 does not depend on the square meters! To decorate a small bedroom is best to use light colors. Warm or cold - depends on whether there is a lot of natural light in the room. 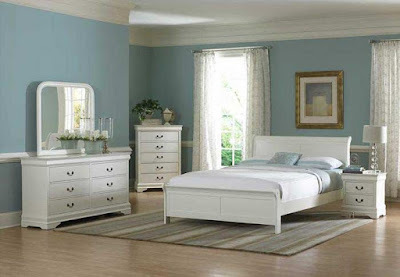 If your bedroom is located on the south-eastern side of the house, it is better to use cold colors. If the room is located on the north-west side or the path of light is blocked by thick foliage of trees - give preference to warm colors. Visually expand the space will help mirrors or mirrored panels, as well as additional point lighting. In a tiny bedroom, it is better to place the necessary minimum of furniture. It is desirable that it was streamlined (that you are less on bumping into corners) and transforming (for example, a sofa instead of a bed). To maximize the use of the space of the room while not cluttering it - choose furniture with built-in niches for storing things (sofas, ottomans, tables). To decorate the ceiling, do not use bulky elements like beams or multi-level structures. And do not overdo it with accessories! For a small bedroom, 2-3 bright accents are enough.